NASA's Chandra X-ray Observatory has been used to identify the young Sun-like stars in NGC 6231, which have, until recently, been hiding in plain sight. Young star clusters like NGC 6231 are found in the band of the Milky Way on the sky. As a result, interloping stars lying in front of or behind NGC 6231 greatly outnumber the stars in the cluster. These stars will generally be much older than those in NGC 6231, so members of the cluster can be identified by selecting signs of stellar youth. The Chandra data, combined with infrared data from the VISTA telescope, have provided the best census of young stars in NGC 6231 available. 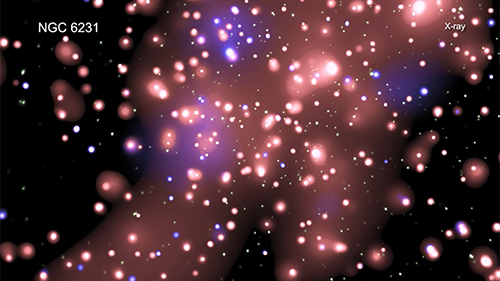 By studying this cluster and others like it, astronomers hope to better understand our Sun's origins and our shared cosmic ancestry with stars across the Galaxy. 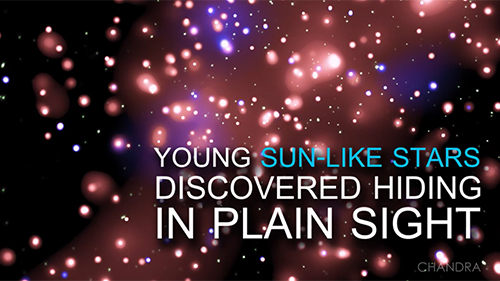 Astronomers think that our Sun was born in a cluster of stars about 4.6 billion years ago that quickly dispersed. Studying other stellar clusters helps scientists better understand how stars — including our Sun — are born. NGC 6231 is a relatively nearby cluster in the Milky Way galaxy with thousands of stars. NASA's Chandra X-ray Observatory has been used to identify the young Sun-like stars in NGC 6231, which have, until recently, been hiding in plain sight. By combining X-rays from Chandra with infrared data, astronomers have compiled the best census to date of the stars in NGC 6231.